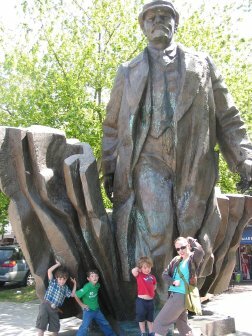 Have you heard of the Fremont Lenin Statue? 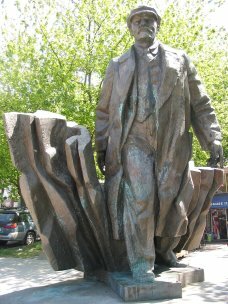 I would have never guessed there was a Fremont Lenin statue in Washington, but the Fremont district is well-known for it's quirkiness, and this statue fits right in. This statue was actually made in Poprad, Czechoslovakia in 1988. However, communism shortly fell and the statue was taken down from the square where it had been installed. A guy from Washington by the name of Lewis E. Carpenter was teaching English in Poland sometime later and saw the statue in a scrap yard getting ready to be melted down. Well, Carpenter realized that the statue was a work of art and found a way to bring it back to the Seattle area. There was a lot of controversy surrounding his importing the statue, and during this controversy, he actually died in a car crash. Well, his family finally found a temporary place for the statue in Fremont at the interesection of Evanston Ave N, N 36th St, and Fremont Place. It sits right outside a Taco Del Mar, which is where we were eating when we decided to take a tough-looking picture in front of the statue. Our boys started crawling and climbing all over it, and I'm sure they weren't the first ones, especially seeing as how it's been there since '94. The statue is actually for sale, so if you're interested in a 16-foot bronze sculpture of this revolutionary, you can buy it for $250,000. Back from the Fremont Lenin statue.